Byron was born with a rare vascular disease and has had a challenging start to life with many surgeries on his legs, growing up in a wheelchair and then using crutches for years. He is now walking up to 8km and doing really well. “I had surgery back in January after being left with next to no cartilage in my knee from years of playing netball. The surgery was pretty intense leaving me non weight bearing for a couple of months. 7 months on I was walking again but stairs and jumping were totally out of the question and what I could manage came with an awful amount of pain and swelling. The improvements in my movement are unbelievable, not only am I walking and climbing stairs pain free, I’m also running again. It was time to get serious. After three kids, not enough time, not enough sleep and my metabolism slowing more dramatically with every birthday, enough was enough. I used to be fit, healthy and able to wear a lovely variety of clothes. Now I was sluggish, carrying too much weight, and struggling to feel good in my own skin. “I started training with Nicki in the lead up to my wedding and was extremely impressed with her holistic approach, encompassing diet and lifestyle as well as exercise and a regular programme. It was fantastic to have a trainer to keep me on track with all of the important things at home as well as at the gym. Nicki also focused heavily on technique and posture, which meant that I always felt like I got the most out of personal training and my own sessions. “Around four years ago I realised how unfit and fat I had become when the doctor told me I had high blood pressure and was overweight. I guess it was obvious to others but I had continued to fool myself and with the pressures of life I just didn’t notice. I weighed over 100kg. I dieted and joined a gym where I started doing mostly cardio and eventually running only, something I had done a lot of when I was younger. I got down to 75 kilograms and my fitness seemed good. I was running 10 to 12 kms 3 or 4 times a week. The trouble was the diet and the amount of time I was exercising left very little other free time. Inevitably I slipped back into old habits and started gaining weight. Last year my wife and I decided to do Nicki’s 10 week challenge, which showed me I can work out less. 2 to 3 short sessions a week of high intensity training, and a careful management of diet was far more effective that the hours of work I was doing on my own previously. I reversed my slow weight gain, losing 6 kgs, decreasing my body fat percentage by 4% but meanwhile increasing my muscle mass. My fitness levels also increased (I beat my city to bay time from when I was running almost exclusively), without having to train for long periods the way I had in the past. Also my strength increased. Since then I continued with the shorter intense sessions and have put on a further 2 kg of muscle while maintaining the same fitness level. A small gain in weight from something like Christmas is easily dealt with by maintaining the workout and diet program already established. Stu continued to train hard and won the 8 Week Challenge (photo below) by signing up to Group Personal Training Sessions. 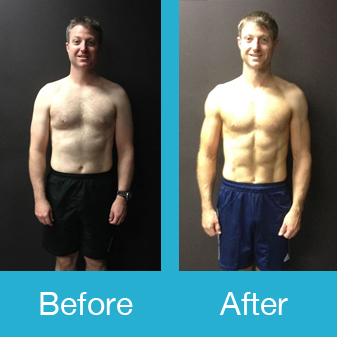 He lost 12.5 kg and 8% body fat in just 8 weeks. I first saw Nicki Jennison floating around the gym back in September 2011. She always said hello and I noticed that the girls she was training looked amazing. After taking quite a few of her awesome RPM classes, she announced that her services were available during the 8 week challenge. I decided to enter the gym challenge, and I knew that Nicki was the trainer for me. Nicki kick started my training with sound dietary advice, which I stuck to religiously. A clean diet backed up with weight training proved to be the ticket. She helped me get my body fat percentage from around 20% to less than 10%. I was 9kg’s lighter in only 8 weeks and my muscle definition had massively improved. With the help, training and support from Nicki, I won the 8 week challenge, and was thrilled to bits. Nicki’s qualifications in Bio Signature, proved to be an amazing attribute also. I cannot recommend Nicki’s services highly enough. If you follow her advice about diet, training and even supplements, you will get results in no time at all. You will become a lot fitter- faster, and transform into the new you. Laura is a single mum with a full time job, and she still found the time to lose 7.5 kg and 6% body fat in just 7 weeks. I am a mother of two who works full time as a Team Leader within the financial services industry. My job can be highly stressful and my working hours change regularly. I am very busy between work and kids. For most of my children’s life I have been a single mother until I met my partner one and a half years ago. Prior to children I was a fitness instructor. I would teach up to 30 classes a week and train on top of this for triathlons. Fitness was my life. Then came the marriage, children, depression, and divorce followed closely by steady weight gain. Becoming a single mother of two at the age of 24 meant that my healthy lifestyle slowly went to the way side. Once I got an office job my weight sky rocketed and before I knew it I had gained a total of 22 kgs. I was not training regularly and quick and convenient food became the norm. I was not seeing improvement in my personal stress or depression even though I was treating these with medication. I was getting sick on a regular basis. I went on a holiday and when I saw the photos of myself I was shocked. I hadn’t realised just how big I was. I realised this was impacting on my health and the health of my children. I tried to do it on my own. I joined a gym and started to attend classes on the odd occasion. 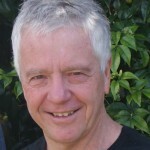 I was unable to make the changes needed to have an impact on my weight and health. I was unaccountable for my diet or exercises regime. I knew I needed to find a skilled trainer who would not just take my money but make me accountable for the choices I was making every day. I wanted direction and a clear plan with regular feedback to keep me on track. That’s when I found Nicki. 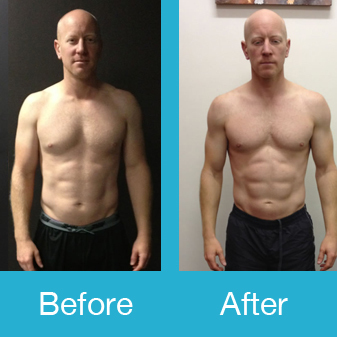 Dan lost 5.9 kg and 5.2% body fat – going from 15.8% to a lean, mean 10.6%. After many years of training in the martial art sport of Taekwondo I approached Nicki requesting her help to devise a programme that would help me maximize my potential. The programme had to be sports specific for Taekwondo but also cater for my job which is in the police force. I needed to stay supple for Taekwondo but also needed strength training for my job. She designed training sessions that would make me strive to reach my full potential. The variety of exercises kept me on my toes and made the sessions interesting and rewarding. Nicki is not just a personal trainer, she is a life coach helping you to focus mentally on what you need to achieve. She not only helped me by attaining better overall physical fitness but also helped me with my attitude and dedication to become a better person. I highly recommend her as a personal trainer. It was during a period of high pressure work I suffered a minor stroke, due to a blood vessel going into spasm, probably caused by a combination of the stress and a medication being taken. This required two weeks of intensive rehabilitation to regain full mobility. As a direct result of this experience I am now dedicated to a fit and healthy lifestyle, my personal trainer for the last eighteen months has been Nicki Jennison. Nicki has helped me set realistic goals, and once achieved has helped me set new ones, all the while being careful to protect my physical wellbeing. Her regular Biosignature body fat assessment sessions have helped to determine my progress and it keeps me on the right track. Nicki has helped correct my posture and strengthen my core, I am now able to maintain this whilst lifting heavier weights or conducting other exercise. I’m feeling fitter than ever before. “It snuck up on me….. I thought I was fit. How wrong I was!! I’ve exercised all my life and that little rest from the rigours of constant exercise I allowed myself had suddenly become a year. My golf was awful, it was a bit of a struggle to get around 18 holes without feeling drained. My knees and back were constantly sore and I found myself struggling with little things that had always been easy. Next thing my doctor is asking awkward questions about my diet, how much I exercise and how much I drink!! Apparently I was a little bigger than ideal and my blood pressure was getting up. You know the story. Thereafter ensued a period of a hundred broken vows to self about getting up and hitting the road, eating better and drinking less…… This has never happened to me before, I was always able to push past the inertia and laziness that’s in all of us. I needed help. A personal trainer seemed the answer. But who? I looked online at every PT in the area and Nicki was the standout. Her breadth of qualification and experience particularly in remedial and rehab were great. Nicki was thorough in my health assessment, helped me to set goals and structured a variety of programs that keep me engaged and motivated. She’s passionate about delivering great health and fitness outcomes and always strives to help with advice, research and encouragement. So, after now 9 months of sessions twice a week under Nicki’s careful guidance and endless patience, I’m stronger, leaner, 5 kilos lighter, and my golf is vastly improved. I can actually see muscle definition and my back and knees are much better too. So, the personal trainer decision was and is the right one for me. In the end, we have to do the work ourselves, whether it’s out of bed at 5am to get to a class or choosing not to put the sugary, processed rubbish we used to eat in the shopping basket. The right PT will give you the best chance of changing habits, and for me Nicki it just that!!! 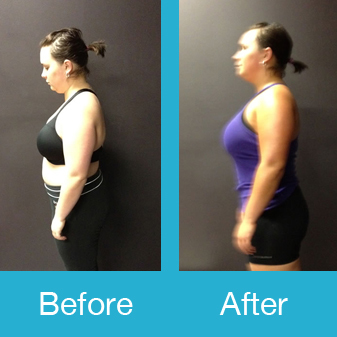 Nicki, thank you for all your hard work, time and effort that you have put into the 12 week challenge. The program has given me the know how, confidence and push to get up off the seat. I can look in the mirror and be proud of what I see furthermore what more I can achieve. You’re a wonderful person who puts her all into everything she does. It’s a pleasure to know you. This 12 week challenge exceeded my expectations, my results were great and I met a great bunch of people. This was all down to Nicki being a great trainer, motivator and supporter. Thanks so much. 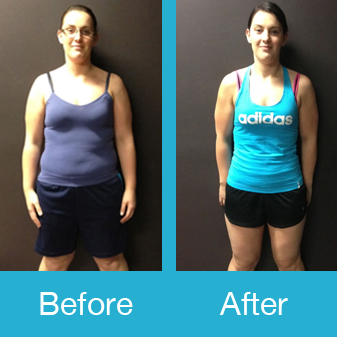 I have known Nicki Jennison since the beginning of 2008 when she became my Personal Trainer at cityfitness, Nelson. From the very outset of this time, my life has changed. The reason being, Nicki’s tremendous support and her faith in my ability to make these changes. I joined the gym with enormous trepidation and Nicki is the reason why I have persevered and have become a keen and confident member. Nicki, through her exemplary interpersonal skills, her enthusiasm, her intense desire to support me and her warmth and friendship, has contributed to my change and attitude and to my desire for a life long commitment to fitness, health and happiness. At times when I have struggled with my programme and low self-esteem, Nicki has ‘gone that extra mile’ to get me back on track. Her attitude and her faith in me has been unwavering and I have always managed to not only continue, but to challenge and extend my goals both physically and mentally. Nicki has empowered me to take responsibility for my own wellbeing and I have only been able to do this because of her tremendous support, her strong belief in me and her very genuine desire for me to make life long, positive changes in my life. I look forward to my training sessions with Nicki and always come away from them feeling confident, positive and with newfound enthusiasm and drive to push myself towards the goals I have set for myself. Through Nicki I have discovered how it feels to be both physically and mentally fit, to have faith in my own ability and to face challenges with confidence I never knew I had. Nicki is an exceptional young woman who is skilled at her work. I consider her responsible for the changes I have made to my life. Not only is she my personal trainer and life coach, but is also a friend for whom I have enormous respect and admiration. When I joined the gym some time in August 2008 I was lucky enough to be linked up with Nicki as my personal trainer for the introduction sessions. While chatting about goals I asked Nicki if she thought I could run a marathon in March 2009 fully expecting her to give me all the reasons I couldn’t do it. Eg; my age (nearly 59), no history of a fitness program lasting more than a couple of months, only six months to prepare for a marathon as well as a the fact she had just met me and had no idea I could commit to such a huge undertaking. The Motatapu marathon is an off road marathon from Motatapu Station (near Wanaka) to Arrowtown. It is an undulating climb with the summit at 887m about the 35km point of the 42kms. Nicki was up for the challenge and in September we started the training. Nicki’s commitment to my goal was amazing. She prepared a programme and we worked through it in at very gradual and steady pace. Nicki challenged me to do my best with out pushing me so hard that it put me off. It wasn’t long before the “hard yards” where behind me and I really started to enjoy the training. It was an amazing experience to go from believing I could not run to looking forward to running farther than I had the week before. Soon after I started training with Nicki I decided to do the marathon as a sponsored run for Depression Awareness as our son had been sick three years ago and during that time I had thought when he was well I would do something to make people more aware and informed about depression. By March 14th I was very well prepared and the actual marathon was great. The weather was perfect for running and I had a wonderful time. Through the sponsorship I raised over $3000 for the Mental Health Foundation for depression awareness. It truly was a celebration of our son’s recovery and reaching my personal goals, which I know I could not have done without Nicki’s expert and professional training. I have learnt that with the right training and preparation I can achieve anything I set my mind to. With Nicki’s help you can achieve whatever you want. She is a very professional trainer who personally connects with your goals and works hard for your success. I wholeheartedly recommend her as a personal trainer. Completing the 12 week challenge with Nicki earlier this year gave me the motivation to achieve my fitness goals and feel fantastic. It was all about learning to be who you want to be and having the opportunity to try lots of new things. The stuff I learnt has become part of my life style and I’m still seeing the results.Thank you so much Nicki for the opportunity. Would recommend this to anyone who wants to change their lives and see great results. Nicki you provide a great balance of experience and humour which has made the 12 week challenge a pleasure for me (even on the hard days). Losing INCHES, loads of them, all over, and it feels Wonderful. Losing my fat clothes, as now I can fit back into my skinny clothes. Increasing from a slow jog to a decent running pace, and being able to maintain it. Technique improvements, especially around using weights and the machines. The lowest weight I have been in 5 years, now that’s a massive achievement! Being able to channel work frustration and problems in a positive sense, particularly through boxing. Smashing my low boredom threshold by offering a different range of exercises every time. That’s a mindboggling 36 different sessions planned. Quite honestly I’d do those three months again and again. Nicki is a really good motivator and technically skilled trainer and the group morale and support was totally unexpected. It made the bad weeks better and the good weeks unbelievable. I’ve learnt things during the twelve weeks that I’ll keep forever. Now that’s priceless”. Nicki’s 12 week challenge was just what I needed to help me to get back to being fit and healthy. The group sessions gave me motivation, and a little friendly competition made me push myself harder and run raster. The variety of the sessions meant it never got stale, and the level progressed with our fitness. I can’t recommend it highly enough! 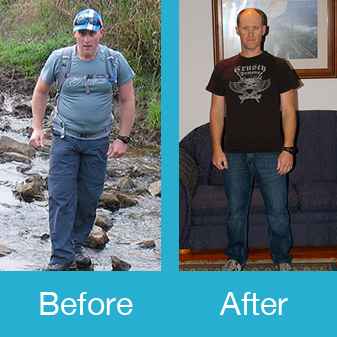 Your program, knowledge and experience allowed me to lose weight and gain fitness. You taught me more ways in which I could keep myself motivated, while providing a safe, fun and professional experience! The group provided the competitiveness and support I’d been lacking, as well as the variety that was missing in my usual activity and lead to my losing interest and seeing minimal results. I learnt what my true limits were, not those that I had mentally put in place. Remarkably I also learnt to enjoy exercise! The knowledge that I can do it! A big thanks from a 43 cm smaller and 7 kg lighter me!